In many of my posts I’ve referred to myself as being a lazy cook. That is, If the dish has too many ingredients, I couldn’t be bothered with it, so most Indian fancy curries are out. That’s the downside. The upside is, that I try to make a tasty dish with as few ingredients as possible and most of the time it works! Who was that who said, get the laziest person to get the job done and they will find the easiest way to do it? Well – that’s my motto. Easiest way to do things, and here I’ve done precisely that. In most Indian curries you will have spices such as coriander, cumin, chilly powder, turmeric, garam masala etc. I’ve done away with all of those and only used aromatics. 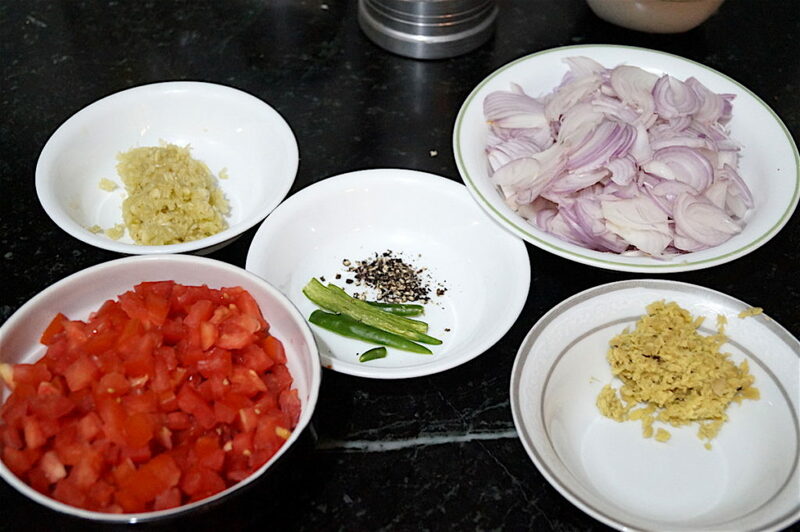 Onion, ginger, garlic, tomatoes and green chillies. The dish came out spectacular! The key here is to reduce the ingredients completely, frying them very well for a very long time so that the flavours get intensified. Then you really don’t need anything else. 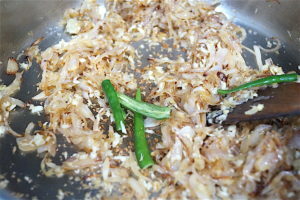 If you want a spicy version, use three green chillies slit through the middle with their seeds intact. For much less heat, remove the seeds. For children, omit the chillies altogether, or just add one de-seeded chilli. This dish really is a must try and will rival any chicken curry with a ton of more ingredients. I am so sure of that. 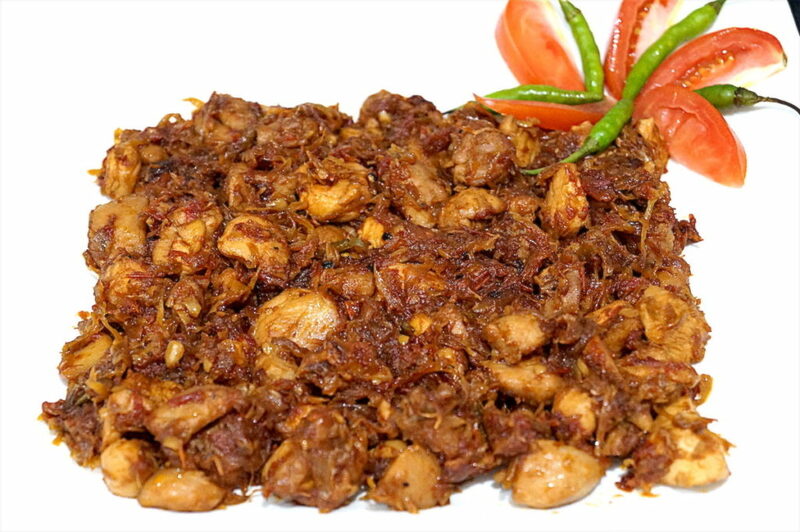 You can even shred the chicken and make it like a bhurjee (scramble). 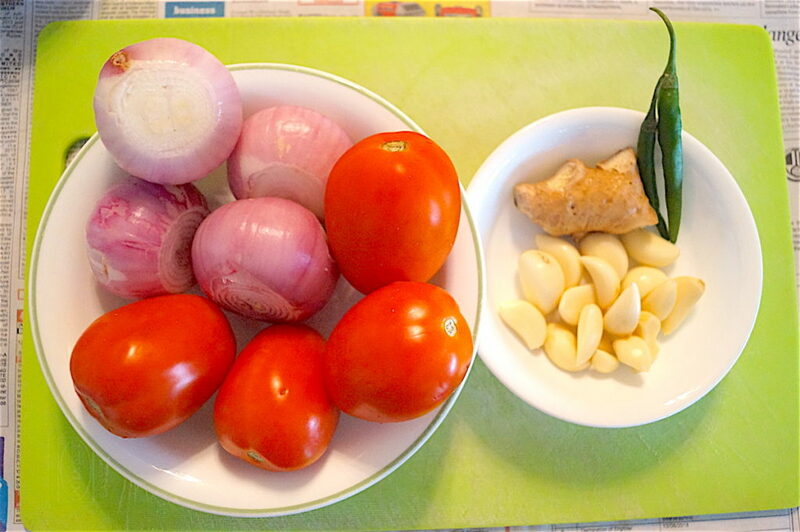 Don’t shy away from using enough onions and tomatoes, remember the more of those, the more flavour you’ll get. And most important, make sure the aromatics are nicely reduced till they’re releasing oil. The colour will come from the stuff sticking to the bottom, which you will be deglazing every once in a while. The yoghurt is optional, it changes the flavour a bit, giving it a slightly creamier texture. I used it the last time I made it. This time I have not. Both versions are yum. You can make it twice. One time with and one time without. Do not use a non-stick pan for this. It’s best to use a nice stainless steel pan or kadhai (wok) to get the browning at the bottom which gives the dish its character and flavour. Not going to say more. Have at it. Keep a glass of water handy as the bottom of the pan will keep browning up as the water keeps evaporating and the mixture starts releasing oil. When this happens, you will have to pour little splashes of water (not too much) to get the browned parts off. This is called deglazing. You will need to do this at least 5 times during the course of the cooking. The deglazing is what gives the dish its colour. Don’t add too much water every time you do this. You don’t want the onions getting boiled. The entire cooking process takes 45 minutes. You have to stir continuously but it’s worth it! 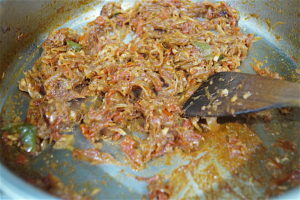 Heat the mustard oil in a pan and add the onions. 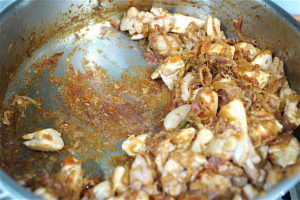 Sauté the onions in the oil on medium flame stirring continuously till they are browned and almost caramelised. Around 10 minutes. Add the green chillies, ginger and garlic and sauté for another couple of minutes till the rawness of the ginger and garlic go. 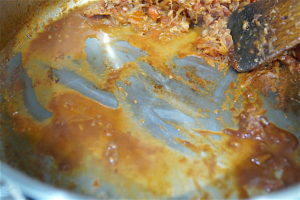 When the bottom of the pan starts browning, add a splash of water and deglaze the bottom. Keep sautéing till the bottom of the pan starts browning again. 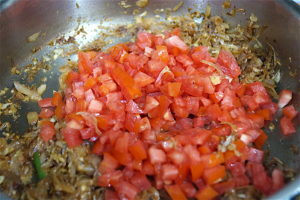 Then add the tomatoes and keep stirring for five minutes till they soften. Add the salt and keep stirring till the tomatoes release all their water and the bottom of the pan starts browning again. Deglaze the bottom of the pan with a splash of water, get all the brown bits out – watch the sides of the pan and deglaze that too. Keep stirring till the mixture starts releasing oil again and the pan browns again. 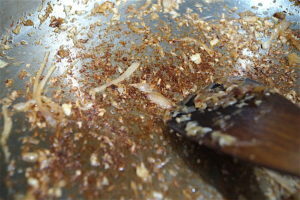 Deglaze and continue stirring. Keep stirring all the ingredients together till they have become nicely reduced and starts releasing oil again, then add the chicken. Stir the chicken for another 10 minutes. Add the crushed pepper now. Add the yoghurt if using it and keep stirring. When the bottom of the pan starts browning, deglaze again. Repeat this two more times in the next 10 minutes. Once you’re satisfied with the taste, remove from the fire and serve. You can make it ahead of time and heat by adding a teeny bit of water and stirring till it all evaporates. Enjoy this dish with parathas, or chapatis, or rice. Important notes: Since there are no masalas being added to this dish, the flavour will come from the slow reduction and caramelisation of the aromatics mix. Don’t add too much water, just small splashes every time the bottom of the pan starts browning up, and mix everything and keep sautéing till the water evaporates again. The key is to reduce the aromatics to a stage where there is total concentration of flavour. DO NOT add too much water when deglazing each time. Add enough to only cover the browned bits. Don’t let the bottom get black. That means it’s got burnt. That will spoil the flavour. Keep stirring all the time. If you don’t stir for a while your dish will get burnt. 1. 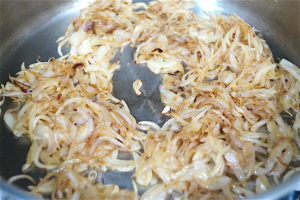 Saute the onions for 10 minutes till reduced to this browned stage. 2. 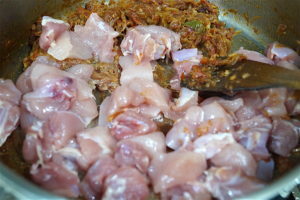 Add ginger, garlic and green chillies and sauce more till the bottom of the pan gets browned. 3. 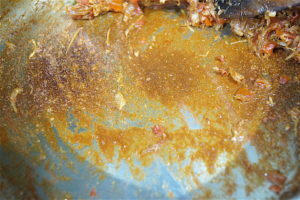 Browned bottom of pan. 4. Add a splash of water to the browned parts before they become black. 5. Scrape the bottom well and keep stirring till the bottom of the pan gets browned again. 6. Add the tomatoes and keep stirring. 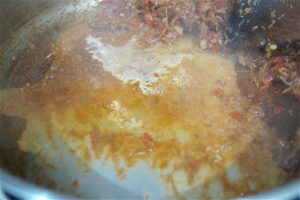 The water released by the tomatoes will deglaze the pan automatically. Keep stirring for five minutes then add salt. 7. Keep stirring till the bottom of the pan gets browned again. 9. Scrape and keep stirring. 10. 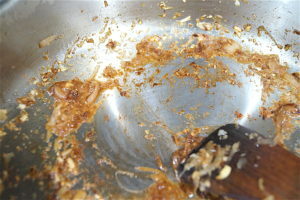 Till the mixture looks like this and the pan is getting browned again. 11. Add the chicken. The water released by the chicken will deglaze the pan. Keep stirring for 10 minutes till the pan gets browned again. Deglaze with water. 12. Add the pepper and the Yoghurt (optional). 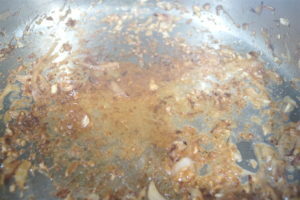 Stir for 10 more minutes, repeating the deglazing process once or twice more. Then you’re done.